The Naismith Memorial Basketball Hall of Fame has just added a new exhibit dedicated to one of the most valuable basketball players in history, Michael Jordan. This exhibit was undoubtedly designed and funded by Nike, Jordan’s largest sponsor. Though the addition to the museum is extravagant to say the least, it is not completely representative of the work that Michael Jordan has put into his 46 years. Most surprising to Jordan lovers, the showcase of his successes does not include any actual memorabilia. 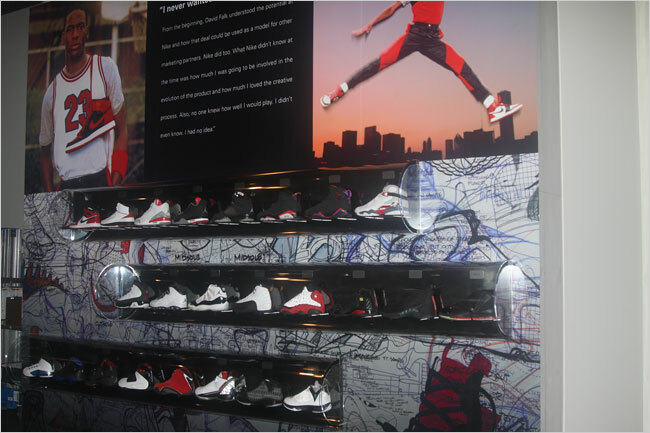 Instead, the exhibit displays Jordan shoes and replica type jerseys never actually worn by Michael Jordan himself. Nike uses their sports players as marketing tools, clearly shown by the new Michael Jordan exhibit. The room displays large posters, videos and merchandise that all promote Nike Inc. According to the New York Times, the exhibit at the Hall of Fame is another marketing tool for the shoe company. Nike has made sure to include all the ways the company played a role in Jordan’s success and less on the demises and hardships that the basketball player endured while trying to get to the top. For Nike, this exhibit is a good way to advertise their products, yet a disappointment for visiting Jordan fans.